How to leverage the enduring human need for analogue experiences to attract and retain more customers in a digital world. Anything that can be digitised will be digitised. But can the digital-connect ever really replace the personal touch? Is word-of-mouse always more effective than word-of-mouth? And what of customers’ enduring need for analogue experiences (think analogue watches, paperback books and multiplex movie theatres, for example). In your rush to embrace your customers' digital mind are you ignoring an equally valuable asset: their analogue heart? Better yet, how can you leverage the analogue heart to provide your company or brand with an unbeatable competitive edge? The answer, according to internationally acclaimed futurist, Anders Sormon-Nilsson is Digilogue — the "translational sweet-spot, the convergence of the digital and the analogue." 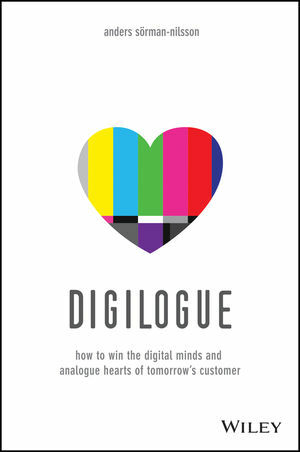 A book that will revolutionise how you do business in a digital world, Digilogue provides powerful insights, strategies and tools to help you provide value to digital minds, while connecting with analogue hearts. Anders Sorman-Nilsson (LLB MBA) is the founder of Thinque - a strategy think tank that helps executives and leaders convert these disruptive questions into proactive, future strategies. As an Australian-Swedish futurist and innovation strategist he has helped executives and leaders on 4 continents map, prepare for, and strategise for foreseeable and unpredictable futures. Since founding Thinque in 2005, he has worked with and spoken to clients like Apple, Johnson & Johnson, Cisco, Eli Lilly, SAP, IBM, Xerox, ABN Amro Bank, Commonwealth Bank, McCann Erickson and BAE Systems, across diverse cultural and geographic contexts. Anders is also the 4th generation future trustee of a 95 year old menswear boutique in Stockholm, Georg Sorman, a business that is currently being digitally disrupted, so he knows first-hand what happens to businesses who don’t succeed in telling their analogue story via digital media. Anders is an active member of TEDGlobal (Oxford 2009 / Edinburgh 2011), has keynoted at TEDx, guest lectured at Sydney University and University of Technology Sydney Business School, and Anders is on the prestigious 2013 Million Dollar Roundtable roster. He is a member of the University of Sydney Global Executive MBA cohort, and has completed executive education at the Indian Institute of Management Bangalore. His latest book ‘Thinque Funky: Upgrade Your Thinking’ on disruptive 2010-2020 trends featured in Monocle Magazine and the Financial Review Boss Magazine.